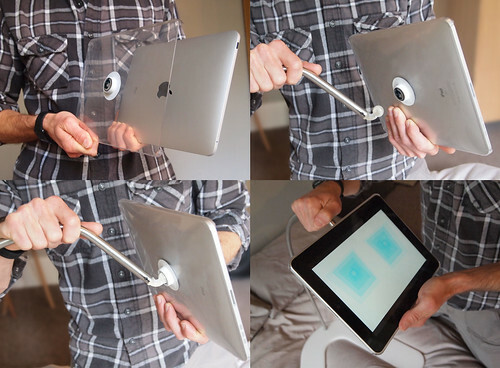 Apart from having a name that helps us create clever headlines, this new Kickstarter project by Designer and Engineer Tim Gushue has one of the most interesting and creative approaches to an iPad stand that we have seen. The project funding target was $27,500 and as of writing the pledges are around $50,000 (with 16 days still to go), so it looks like we will be seeing this thing for real in the near future, along with the iPhone mini version. There are several pledge levels with $35 basically pre-ordering your iPad fitting Infinite Loop, but it will retail for $44.95, so it's worth backing the project now and saving yourself $10 plus a bit of a discount on shipping. If you fancy a 'Limited Edition' black version of Infinite Loop, $75 will secure you both the iPad and iPhone versions in Black, with a nice little printed message declaring your support of the project. 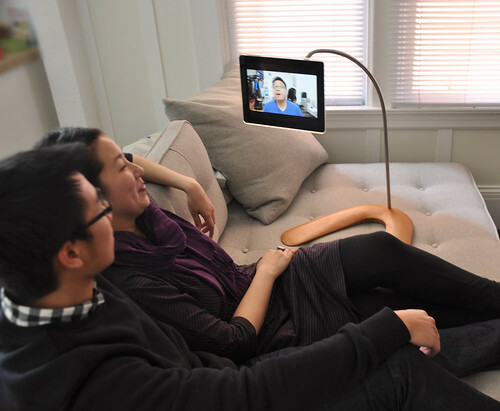 We think the Infinite Loop will be a hit, especially with those who need to travel light with their iPad. More details can be found on the Kickstarter page but be sure to leave us a comment if you order one. You can see the prototype in action below. Surely it's worth bookmarking this post, it might just come in handy for your next holiday. No need to pack an iPad stand, just reach into the hotel wardrobe for a spare wire clothes hanger and 30 seconds later you're golden. These cases are made by Etsy seller vintagecovers (artist Randy Belyk) and the design of the case seems pretty sturdy. We like the strap that fastens around the back cover when closed to keep the iPad wrapped up tight and also stretches across and attaches to the front cover when used as a stand to prevent slipping. Nice touch! There are some pre-prepared covers on the site using vintage books but if, like Larry in the video above, you have a classic book (or comic it seems) then Randy can make you a custom cover. A custom vintage cover for your iPad will cost you around $50, but you really will have a unique case for your iPad. If you get one of these let us know what you think of it in the comments below.